The Sunspotter Keplerian Telescope lets users safely view the light of the sun. This wooden, folded-Keplerian telescope is safe and easy to use. 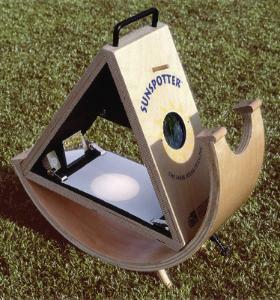 By using a series of mirrors, the telescope projects a 85 mm (3½”) image of the sun onto a white viewing screen several students can see at once. They can trace the changing positions of sunspots and compare them on a daily basis. The kid-friendly telescope has an altitude-azimuth design and can be used to observe eclipses as well. Features include a 700 mm (27½”) FL objective lens, 61.7 mm (2½”) objective aperture, 12.5 mm (1/2”) fully-coated FL Plössl field lens, and 0.75° field of view.